Die Deutsche Arbeitsgemeinschaft für Mustererkennung (DAGM e.V.) 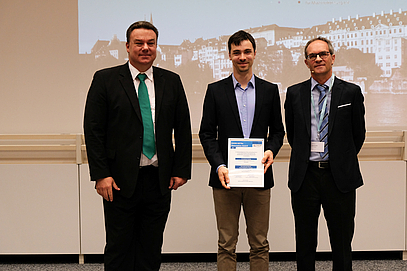 vergibt seit 2015 den DAGM MVTec Dissertation Award. Der Dissertationspreis prämiert eine herausragende Dissertation in den Bereichen Mustererkennung, Bildverarbeitung, Maschinelles Sehen und Maschinelles Lernen, welche im Vorjahr erfolgreich abgeschlossen wurde. Ein Bezug zur DAGM ist erwünscht. Der Dissertationspreis wird von der MVTec Software GmbH gestiftet und ist mit einem Preisgeld von 2.500 Euro ausgestattet. 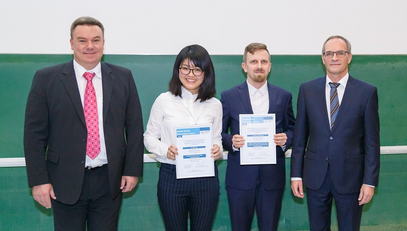 Im Jahr 2018 wurden zwei gleichwertige Dissertationspreise an Frau Dr. Siyu Tang und Herrn Dr. Mateusz Malinowski vergeben. 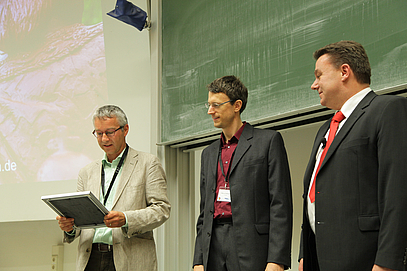 Im Bild (von links nach rechts) Prof. Dr. Carsten Steger (MVTec Software GmbH, TU München), Dr. Siyu Tang, Dr. Mateusz Malinowski, Prof. Dr. Reinhard Koch (Präsident der DAGM e.V.). Dr. Siyu Tang graduated in media informatics at RWTH Aachen University and received her Master’s degree in 2011. She then worked as a researcher at the Max Planck Institute for Informatics in Saarbrücken from 2011 until 2017 under the supervision of Prof. Bernt Schiele and received her PhD degree from Saarland University in 2017. She currently is a Research Group Leader at the Max Planck Institute for Intelligent Systems in Tübingen. 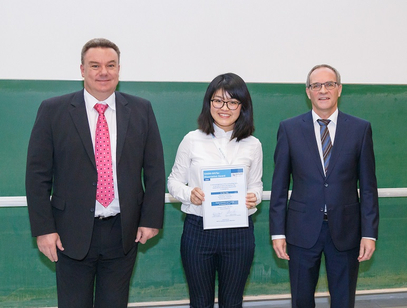 In her thesis, entitled “People Detection and Tracking in Crowded Scenes,” Siyu Tang made significant contributions in the area of multi-person tracking and detection. She proposed novel and rigorous mathematical formulations based on minimum cost multicut models that perform well for challenging real-word visual scenes and thus have defined the state of the art in this area, winning the Multi-Object Tracking Challenge at ECCV 2016 and CVPR 2017. Dr. Mateusz Malinowski graduated in computer science at Saarland University and received his Master’s degree in 2011. He then worked as a researcher at the Max Planck Institute for Informatics in Saarbrücken from 2011 until 2016 under the supervision of Dr. Mario Fritz and received his PhD degree from Saarland University in 2017. He currently is a Research Scientist at Google DeepMind. In his thesis, entitled “Towards Holistic Machines: From Visual Recognition To Question Answering About Real-World Images,” Mateusz Malinowski pioneered the work on visual question answering. He created the foundations of this task, built the first dataset with natural questions about real-world images, proposed evaluation methods, and developed two first approaches for answering questions about images: one connects with more traditional fields of AI, the other one builds upon the recent progress on deep learning. The task and methods have become very influential in the computer vision community, which even led to separate tracks for visual question answering at top-tier conferences such as NIPS and CVPR. 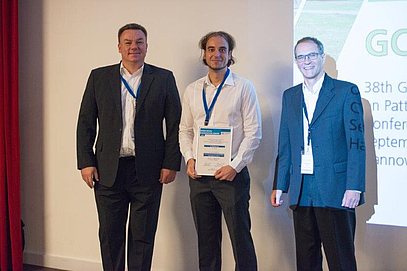 In 2017, the DAGM MVTec Dissertation Award was granted to Alexander Freytag. Dr. Alexander Freytag graduated in computer science at the University of Jena and received his Diploma degree in 2011. He then worked as a researcher at the University of Jena from 2011 until 2016 under the supervision of Prof. Joachim Denzler and received his PhD degree from the University of Jena in 2016. He currently is a Research Scientist for Machine Learning and Computer Vision at Carl-Zeiss AG, Corporate Research and Technology. In his thesis, entitled “Lifelong Learning for Visual Recognition Systems”, Alexander Freytag tackled the problem of lifelong learning in a very general manner, including not just the efficient incremental learning of classifiers over time, but also the detection of unknown objects, which is called novelty detection or open set learning. His main contribution arises from the EMOC (Expected Model Output Changes) method, an original and effective optimization criterion for active learning. He was able to close the loop in lifelong learning for the first time and demonstrated the effectiveness of his approach in several, diverse applications. 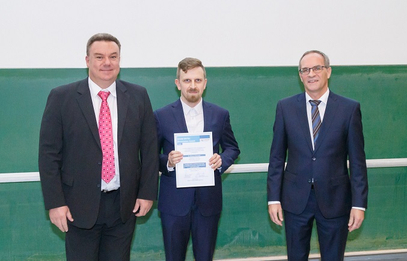 His thesis also received an award for the best dissertation in 2016 from the Faculty of Mathematics and Computer Science of the University of Jena.